Just a stone’s throw away from Bugis is Salted & Hung which is run by renowned Chef Drew Nocente. 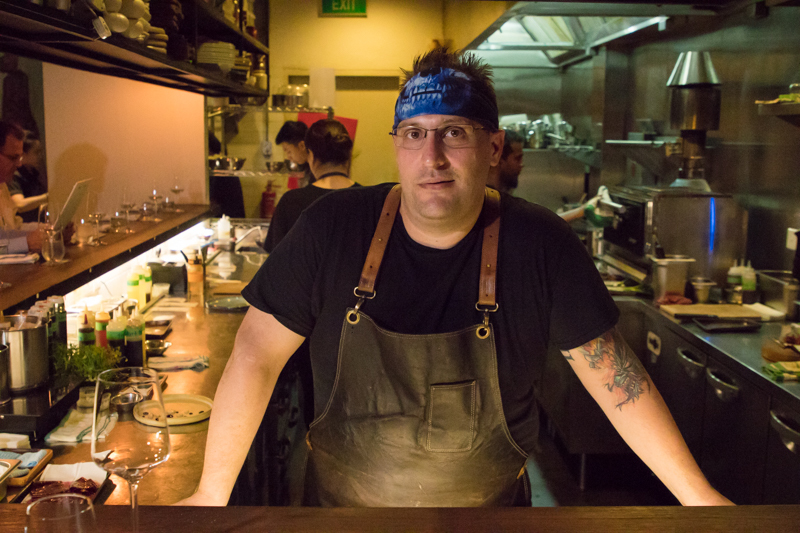 Chef Drew Nocente started his career at a tender age of 15. His career took off when he was offered by celebrity Chef Gordon Ramsay to work as a sous chef in Chef Gordan’s Maze Grill in London. 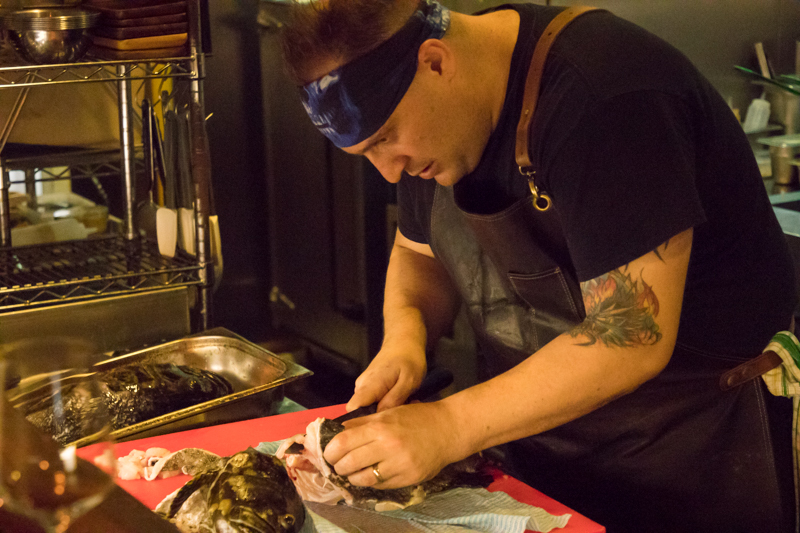 Always up for a challenge, after three years, Chef Drew decided to step out and went over to Salted & Hung. 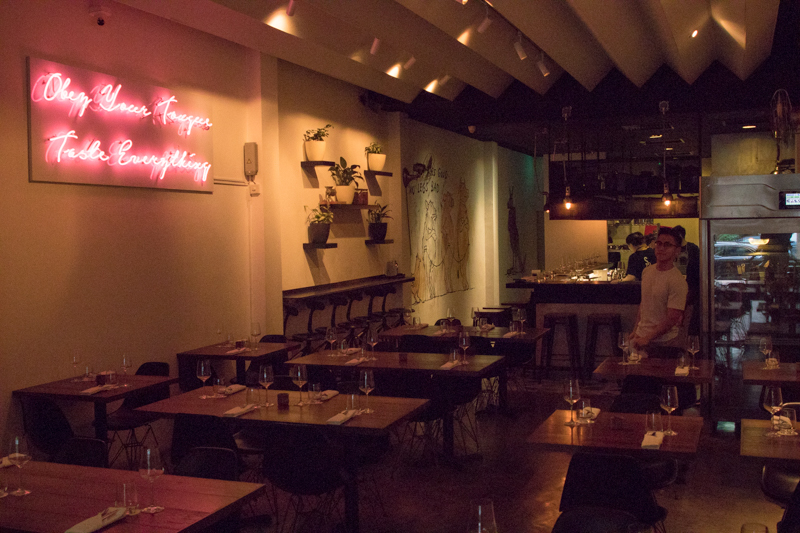 Salted & Hung has been previously known to serve cured sausage, charcuteries and other small plates paired with wine. 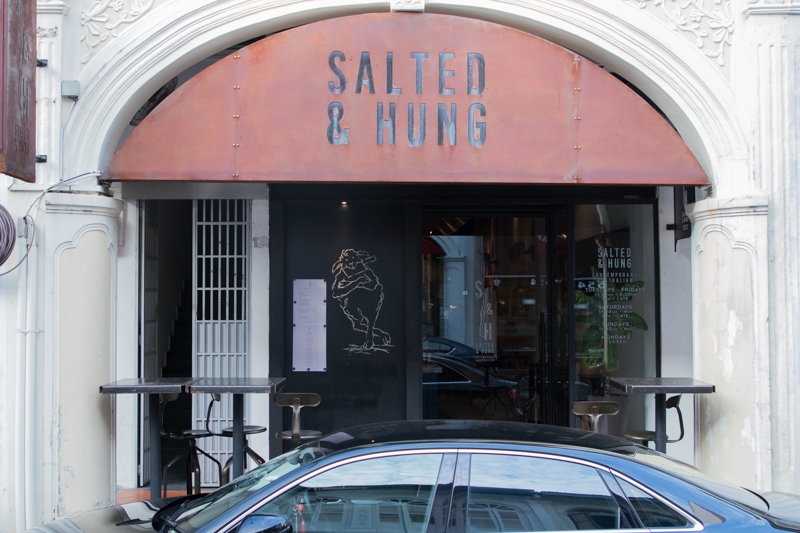 However now, Salted & Hung has fully revamped their menu to be a lot simpler with only a one-page menu. Starting off with the smaller bites, we had a Uni And Caviar Tart (S$12++ each) in what looks like a Chinese “kueh pie tee” cup. 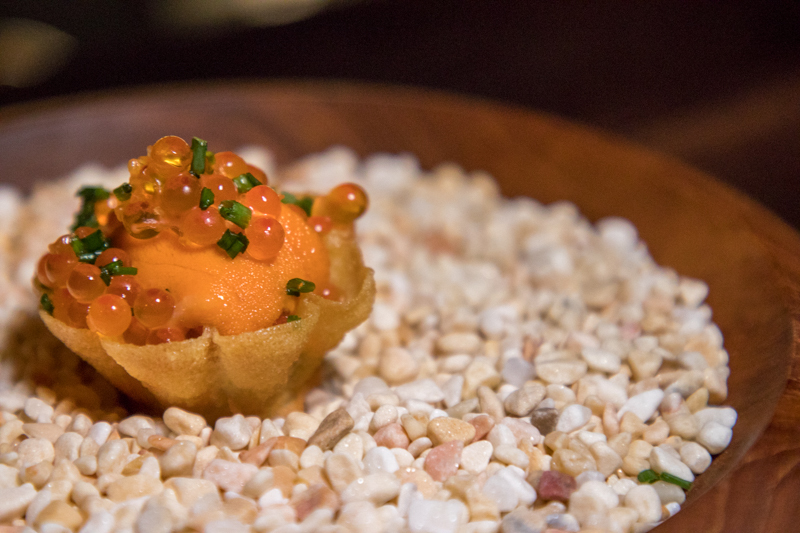 The cup contained kelp cream, ikura (trout or salmon roe) as well as the most prized ingredient, Bafun Uni. 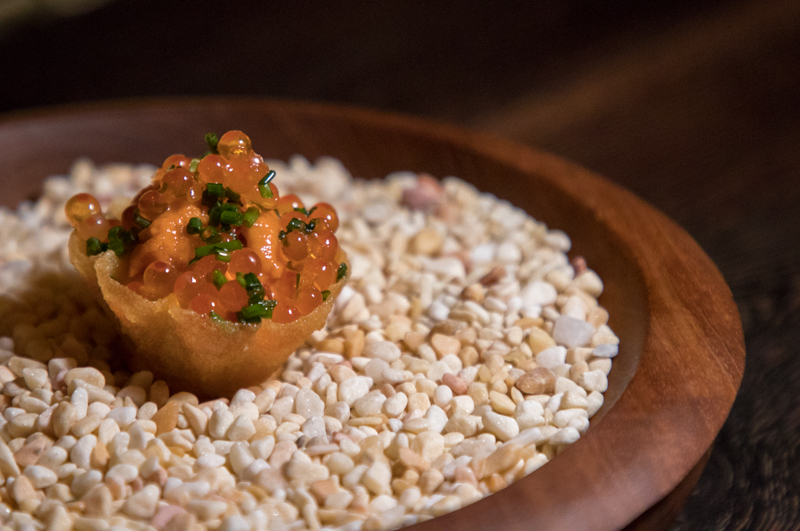 The ikura has been soaked in sake to bring out the subtle saltiness as well as to give an alcoholic kick at the end. The ikura gave a satisfying pop in my mouth, releasing a burst of sweetness from the sake. On the other hand, the uni was rich and decadent with a butter-like consistency. It had a strong briny flavour with a hint of sweetness that hit the back of my throat. The umami kelp cream held everything together. Popping the small cup in my mouth led to an explosion of flavours and textures. The crispy tart cup went well with the creamy uni and ikura added pops of briny flavour too. The tart held all the fresh, sweet yet savoury flavours of the ocean all packed into a bite. However, I felt that the tart shell was slightly too thick and I had a hard time chewing on it. Moving onto the mains, we had their signature Quail With Chilli And Quail Reduction (S$22++). 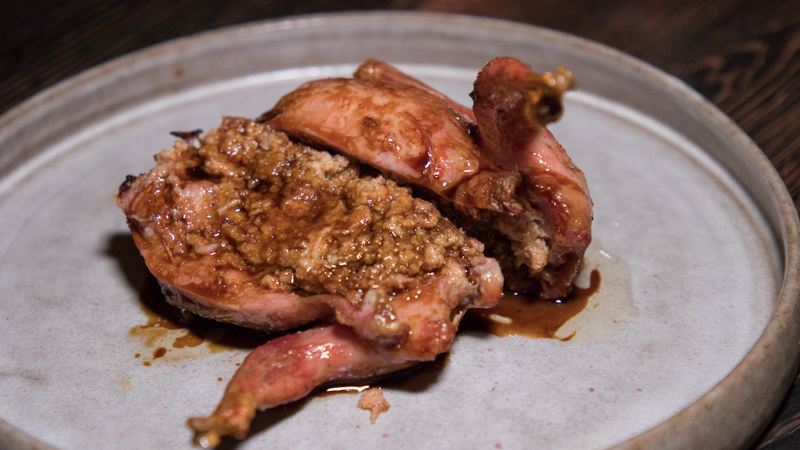 The bird was carefully picked clean of any bones before it was stuffed with a housemade sausage seasoned with chicken rice chilli. 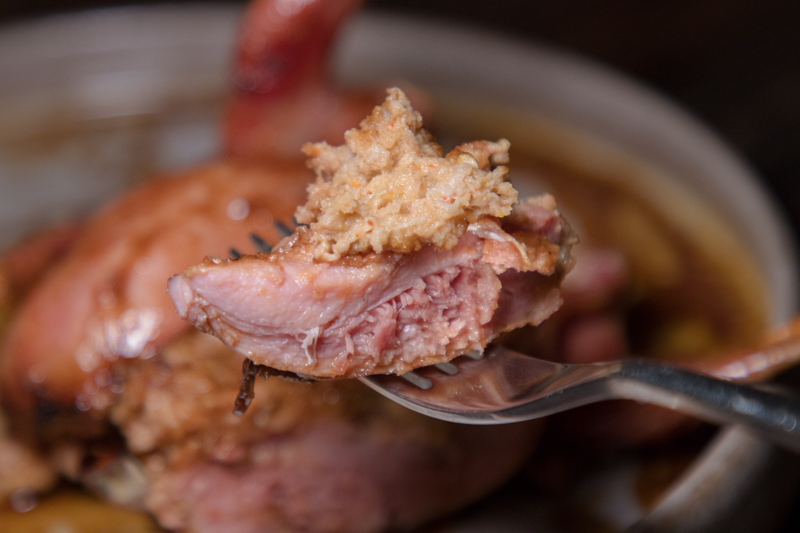 Chef Drew uses the bones to make a reduction sauce and drizzles it over the quail, enhancing its gaminess. The sausage had a prominent tanginess from their house-made chicken rice chilli. There’s citrusy yuzu added to the chilli, which cuts through the greasiness. 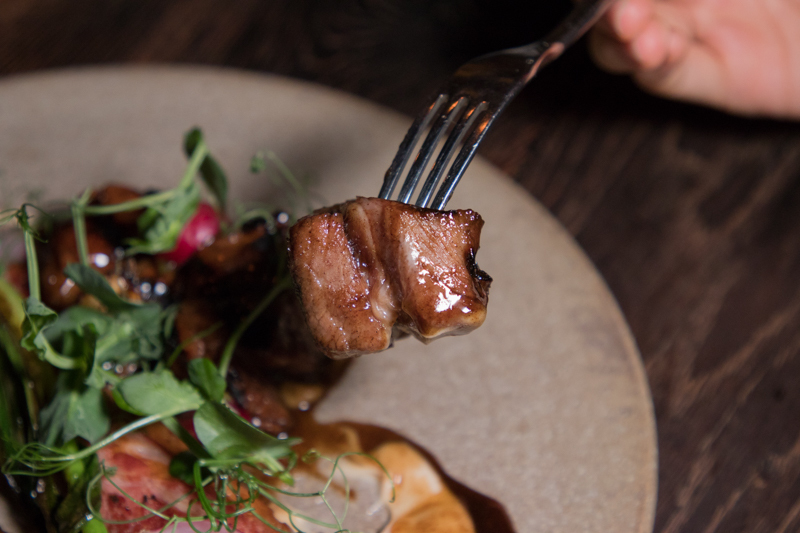 On top of that, the smoky sausage added some depth of flavour to the succulent and juicy quail. However, I felt that the sausage stuffing was too salty and overpowered the savoury and gamey flavours of the quail. I got a little jelak after the first few bites because of how overly salty the stuffing was. 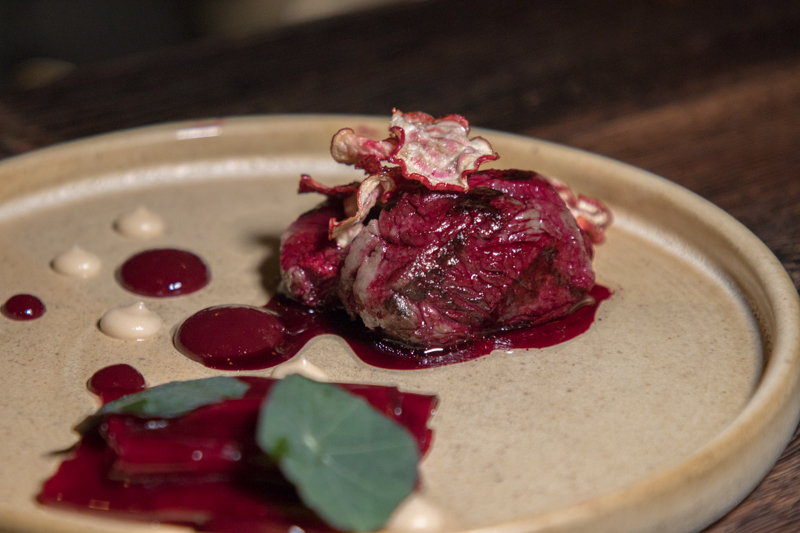 If you’re looking for something more unique, try the Kangaroo With Beetroot And Celeriac (S$18++). 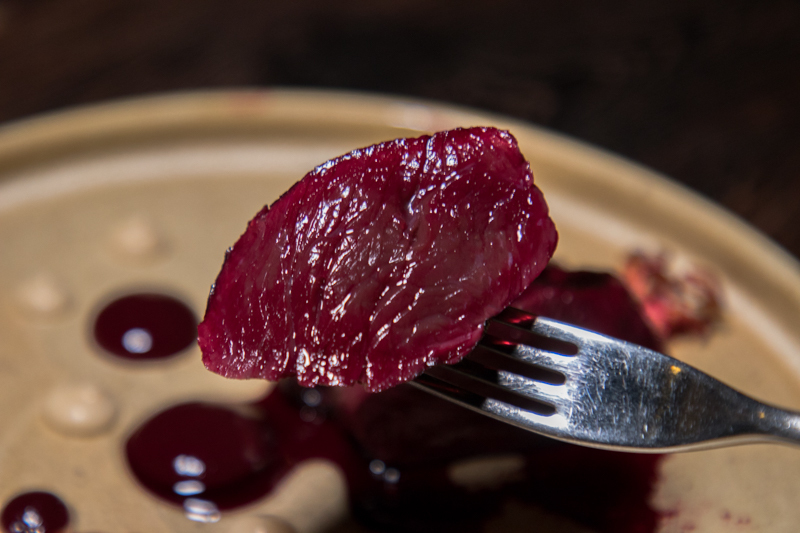 The kangaroo meat was soaked in a brine for 24 hours to be tenderised. Eating the blood-red meat together with the cherry and celeriac jam was heavenly. The meat was extremely tender and broke apart with very little chewing. What surprised me was that the meat was extremely lean with no fats, yet it tasted almost as if it had plenty of fat marbling. The tartness of the cherry jam added a layer of flavour while the sweetness reduced the otherwise strong gamey taste of the kangaroo. The celeriac jam, on the other hand, provided an earthiness which contrasted the sourness from the cherry jam. 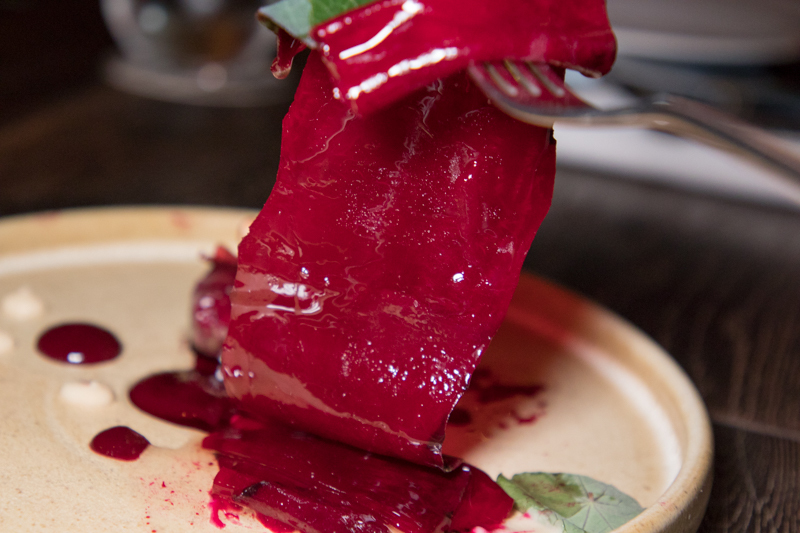 A long strip of beetroot is also served on the side. It tasted slightly sour but had a herbaceous aftertaste. I enjoyed it because it added a crunchy texture to the meaty dish. Last but not least, we tried the Lamb Charsiew (S$48++) which was inspired by the ordinary charsiew we get from hawker stalls. Instead of pork, the chef uses lamb, which he marinates for five days to replicate the tenderness and juiciness of charsiew. 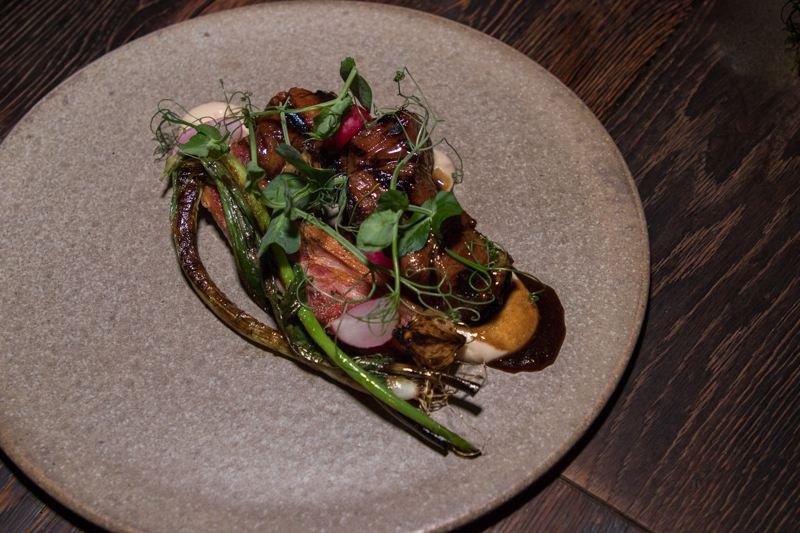 The lamb was extremely succulent and I really enjoyed the fats-to-lean-meat ratio. 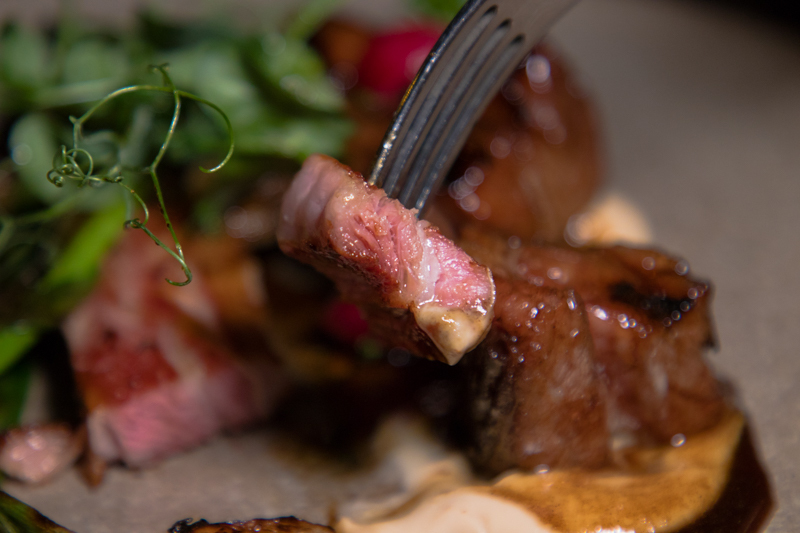 The outer layer also had a caramelised sweetness and the sauce elevated the sweetness of the lamb meat. 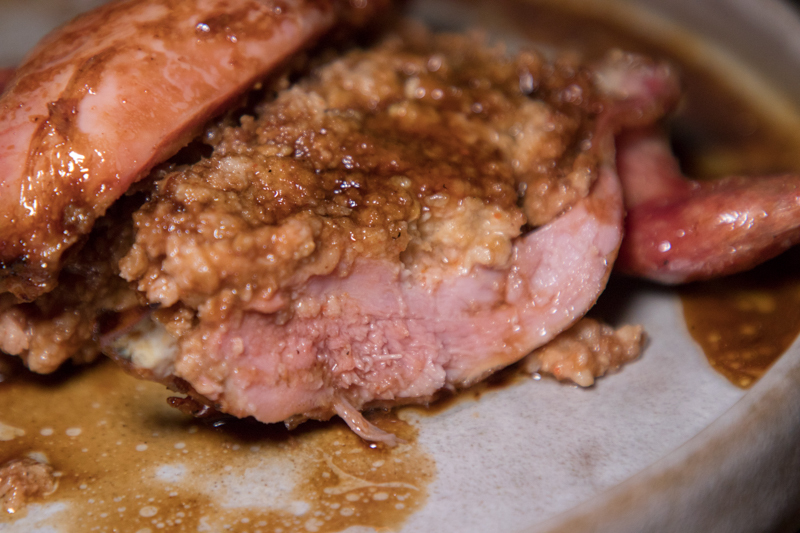 A thick-cut strip of duck fat was served on the side. Fried and rendered down, it had a good crunch and the fats melted in my mouth easily with a creamy flavour. 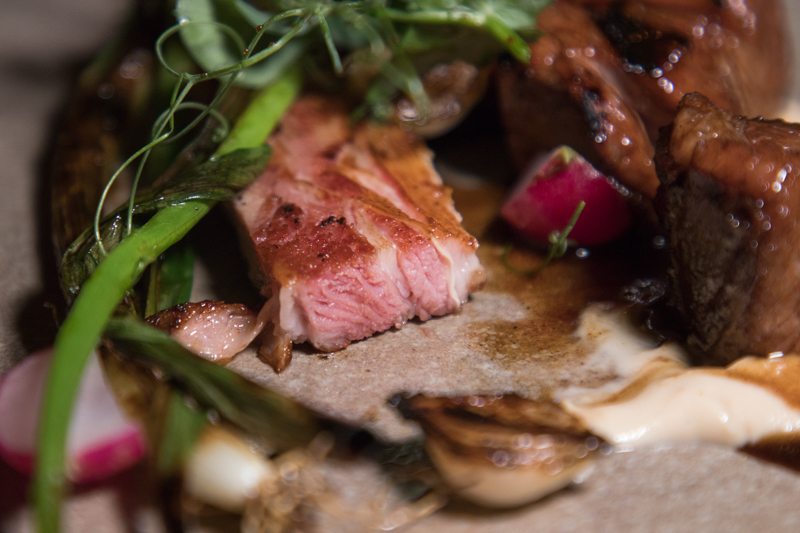 Having the duck fat with the lamb also added a layer of smokiness to the lamb dish, and the fats prevented the lamb from drying out in my mouth. The Lamb Charsiew (S$48++) really impressed me as it was really similar to charsiew dishes I would find at a coffee shop. However, I wished that there was a refreshing element to it such as a lemon slice or something acidic to cut through the oiliness of the dish. Salted & Hung’s new menu demonstrates Chef Drew Nocente’s years of experience, featuring creative twists on Chinese classics like the Lamb Charsiew and the seafood kueh pie tie. With all that said, I believe some fine tuning in dishes such as the Quail With Chilli And Quail Reduction might improve the dining experience further. However, if I am in the area and looking to treat myself, I might just pop by again.